The MXR M81 Bass Preamp by Jim Dunlop is an incredibly well-built, portable effects pedal that can travel with you to any live gig. 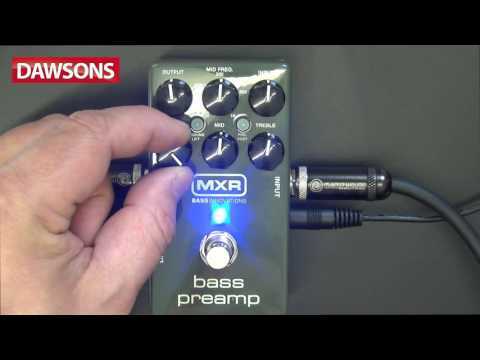 The MXR team of designers have come up with a superb bass preamp pedal that will do a wonderful job of enhancing the overall output of your bass guitar, no matter what model it is or what style you play. The Phase 90-sized preamp box offers studio-quality Direct Out which enables you to play with a range of tones to suit your bass and chosen amplifier. Aboard the pedal there are separate Input and Output level controls combined with a brilliant 3-band EQ. The 3-band EQ also has a sweeping mid-range frequency control from 250hz to 1khz, allowing you to adapt and amend a huge scope of varying bass tones. Other EQ controls include Bass and Treble to contour levels of low end and high end tones. The M81 Bass Preamp includes a Pre / Post switch that decides whether the Direct Out signal is affected by the 3-band EQ or not, while there is also a Ground Lift switch which counteracts ground bass loop humming. Jim Dunlop employ Constant Headroom Technology in the design of the MXR M81 Bass Preamp pedal which gives you plenty of volume through the amplifier. There are Input and Output jacks as well as the Direct Out jack and a 9v AC adapter jack, but the pedal can also be powered by a 9v battery. The M81 comes with a factory preset; 1/4" out buffered bypass and the Direct Out is active. To engage the pedal there is a true bypass footswitch and a blue LED light will come on to show you when the pedal is switched on. The Jim Dunlop MXR M81 Bass Preamp is the ideal companion for any live bassist looking to improve their tone.